Fall has officially started and it is getting cold here. With the change in the weather, health is also likely to get affected. For the past 2 days, I have been suffering from sore throat and I prepared Kollu Rasam as a home remedy. I got the recipe from my friend Geetha and did some tweaks to suit my taste buds and It came out delicious and was so soothing for the sore throat. My husband too loved this rasam. 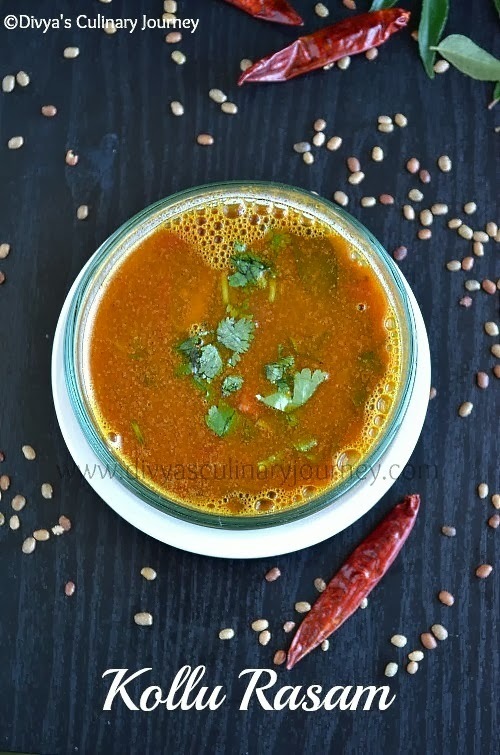 Coming to today's recipe- Kollu Rasam, It is a spicy tangy soup prepared with horse gram. Kollu is supposed to have lot of health benefits like remedy for cold, lowering cholesterol, helps in loosing weight etc., Though it is very good for health, pregnant ladies or person having tuberculosis & plethora must stay away from horse gram. Soak Kollu for about half an hour and pressure cook it along with 2 cups of water and a teaspoon of oil. Let the pressure release and then drain the excess water and set aside. Add more water to the dal, slightly mash and then drain them. Soak tamarind in warm water and extract the juice and discard the pulp. Add tamarind juice along with extracted kollu water and keep it aside. I got about 3 1/2 cups of liquid together. Crush garlic, cumin seeds and pepper and keep them ready. Heat oil in a skillet, add mustard seeds and when they crack add chopped pearl onions, curry leaves, crushed garlic, green chillies and fry till the onions turn translucent. Then add the chopped tomatoes, pinch of asafoetida, crushed cumin and pepper along with turmeric powder, mix well and cook till tomatoes turn soft. Then add the tamarind and kollu water mixture, add salt to taste, check the consistency add more water if needed (I added about 1/2 cup more), then bring it to boil, then lower the heat and let it simmer for 4-5 minutes, then turn off the heat. Then add a handful of cilantro mix well and serve warm. The cooked kollu can be used to make dhal, sundal or chutney. I used to make sundal and will post the recipe soon. According to personal heat tolerance level adjust chilli and amount of pepper. Since I consumed this as a remedy for cold, this amount was perfect for me. i love horsegram and interesting to know about this rasam... bookmarking it! Very comforting and my favourite rasam..
now its perfect fall weather to have hot bowl of sambhar and rasam to indulge. going to try soon. Very comforting rasam. Bookmarking it. 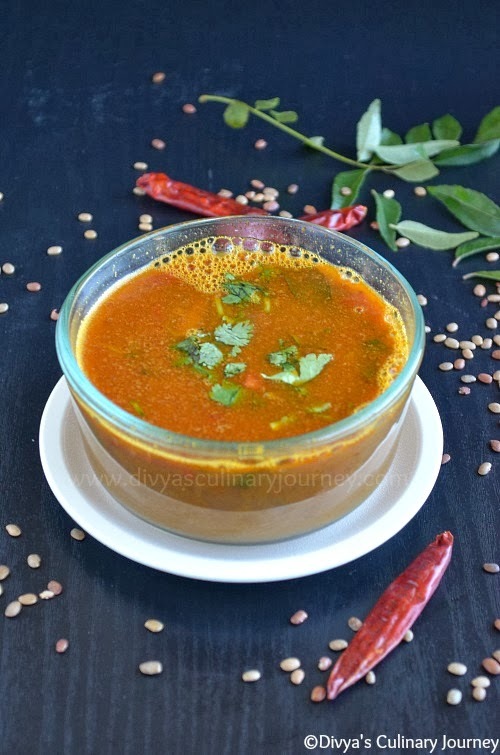 Healthy & tasty rasam good for cold and cough, wonderful dear ! Rasam with horsegram, that is something nw to me. Nice recipe Divya, will try it out on one of the cold winter days. wow..your version of kollu rasam sounds too good...will try this way, with onions...good one Divya! I have this really bad cold, and wish I could have some of that rasam. Love it!